However, if you’re going to cut them up as seem herein, then rolling each one is not necessary, as the oils will be release as we quarter, seed, and slice. This is a good thing, as we need all the time-savings we can get, since what we are going to do, is painstakingly remove the center white membrane. I believe this will make your marmalade even less bitter, but mostly it’s for appearance. For me, those little white bits spoil the perfect, clear-orange jelly that’s produced. But if you think I’m crazy, and you want to save a half-hour, you can probably skip that step, as long as you get all the seeds. I really hope you give this a try soon. Enjoy! - Note: You can just go by appearance, but I took the temperature right before it was done, and it was bout 215 F., so I imagine when I was finished it was around 220 F. You can also put a spoonful on a plate in the fridge, and test that way. What amount of whole kumquats did you use? 200g? 500g? I've never tried a Kumquat, but may have to with this one. Looks delicious. Would it be ok to mention the 'fingernail test' here? Put a drop of the syrup on a cold plate, let it cool, and push a fingernail through it. If you get a distinct wrinkle in the surface, and the gap stays open for a while, you've got a good set for your marmalade or jam. Could I make sauce for orange chicken from this? This beat Seville oranges...hands down! My family has access to loquats. Do you know how those would work in this recipe instead of kumquats? This is exactly the type of marmalade I grew up on in Northern California. My grandmother lived in Scotia, and made it with Loquat. I loved the jam but hated when she made it because my brother and I being the only grandkids would get wrangled into doing the seeding. Loquats have much bigger seeds than Kumquats but I think Loquats taste a bit sweeter and less bitter than Kumquats. I never knew (or thought) to roll them before eating! I can't wait to get home and try it out! Thanks John! What does "generous" mean? 2 1/2 cups? Does it not make a difference so you don't have to be exact? Spectacular color! What a wonderful recipe. I have preserved kumquats and gifted them to friends at Chinese New Year. They are a great fruit. Will that recipe process for long term storage? Here in Louisiana our kumquats are always ripe and ready in mid-winter. I got too busy to even think about picking mine until today, April 27th. With Chef John's recipe I just made the best marmalade ever. A fat two cups of chopped kumquats made two half-pint jars of finished marmalade. Great EASY recipe. It's a keeper. Thanks Chef John!!! Two years ago a friend gave me a couple of gallons of kumquats. Making marmalade took me most of an afternoon and I processed the jars and gave some away as gifts. Next time I will use star anise, which is a great idea, thanks! I have used the marmalade in a sauce for pork chops, stirred it into softened butter for cranberry scones, used it in a ham glaze, and added it stir fries. From one passionate cook to another, thanks, Chef John! Made it yesterday! Wonderful! Thanks for the recipe! This is the best marmalade I've ever tasted. Wow. So good. made this recipe today but came out extremely bitter barley edible anyone know why? This looks fabulous. Is it a recipe that I would be able to can? If so, how long would I process the jars? I was thinking 10 minutes. I found it next to impossible to get them into our house. They were all eaten immediately after picking. Except for the ones my grandsons threw at each other! The rind is the best part - I rarely eat the insides, just outside. I did manage to sneak some in once, and made a kumquat zucchini quick bread - YUM. Thanks for a good recipe for me when I get some more. Just made one batch this morning following your recipe. Just as easy as you said. Delicious too. It made about 9 ounces. Filled one 8 oz jar with a little left over to taste. Glad I didn't need to use gelatin to thicken. These kumquats taste great. Orange marmalade can be quite bitter, but this one only has a nice slight bitterness to it. I started cutting them into quarters and removing the white bit, but after a few I switched to cutting them into little citrus circles. They look cute and it's a lot less work. After 5 minutes of boiling I removed a few spoons of citrus circles and dried and sugared them according to your candied lemon recipe, so I now have 5 jars of marmalade and 1 jar of candied kumquats. Thanks a lot for these awesome recipes! I absolutely love marmalade! 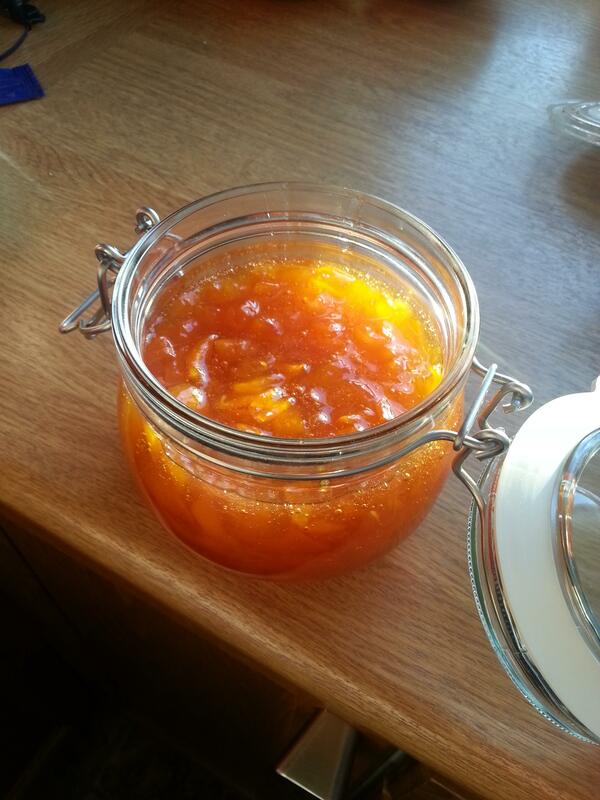 I made this and it is the best marmalade i ever had! Thank you for sharing this recipe. I never considered making a marmalade before this. I have a cumquat bush in my front yard, this was the perfect recipe, everyone loves it! Love this marmalade! Today's was the third batch I've made. The second batch turned out a bit bitter because I was trying to reduce the amount of sugar, but with this last batch, I used 3/4 c. of sugar and 1/4 c. of sorghum which I think will turn out fantastic. On the second batch I also forgot to add the lemon juice and zest. I made sure to include that in the this last batch. I'm getting to be a pro marmalade maker. If these little guys weren't so labor intensive to cut up, I'd make this stuff to sell at the local farmer's market. By the way, once I quarter them and remove seeds and white membrane, I buzz them in my food processor instead of cutting them into little chunks by hand. Saves time! Thanks so much, Chef John. Love your blog and videos!! !